We’d love your help. Let us know what’s wrong with this preview of The Changeling by Philippa Carr. 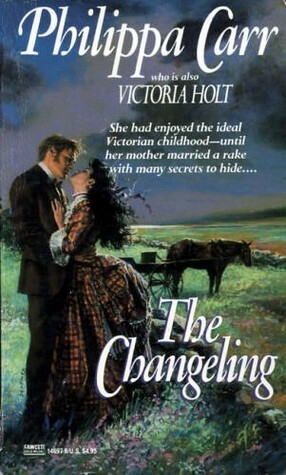 The story of The Changeling is told by Angelet's daughter, Rebecca, who was born in Benedict Lansdon's grandfather's house in an Australian gold-mining township. Before Rebecca was born, her father had died saving another man's life. She had always looked up to him as a great hero and when she heard that her mother was to marry Benedict Lansdon, she was deeply shocked. To ask other readers questions about The Changeling, please sign up. Fifteenth in the Daughters of England historical fiction series in the gothic romance vein. The focus in this one is on a Victorian-era daughter, Rebecca Mandeville and her family. A typical gothic romance with cozy overtones that thwart Carr's attempts to create tension and drama. I'm not sure if my frustration with this is due to how long ago this story was first released and the silly tropes used in this were typical of the writing styles when this was written or if this was an aberrati Fifteenth in the Daughters of England historical fiction series in the gothic romance vein. The focus in this one is on a Victorian-era daughter, Rebecca Mandeville and her family. A typical gothic romance with cozy overtones that thwart Carr's attempts to create tension and drama. I'm not sure if my frustration with this is due to how long ago this story was first released and the silly tropes used in this were typical of the writing styles when this was written or if this was an aberration. I know I liked Victoria Holt, one of Carr's pseudonym's, when I was a kid. That said, the protagonist, Rebecca, annoyed the hell out of me. She's such a snot. Granted, she has reason for her unhappiness, but even as she grows, she doesn't acknowledge how unfair she's been, although she's quite keen to disparage others for doing exactly what she's doing. She is so incredibly clueless… And I thought this was the Victorian era when single women couldn't go anywhere unattended? Rebecca goes EVERYwhere unattended. Including into some very dubious establishments. What is Rebecca, or should I say, what is Carr thinking? I'm confused. If Angelet and her husband went to Australia to make it big and come back to England to live in comfort, how has she managed her current comfort if he died there? Then there's Benedict's marriage to Celeste. Supposedly he needs a wife who can hostess dinners, etc. for this upcoming and brilliant politician. And she can barely speak English. How does this make her an asset? That penultimate scene between Pedrek and her…MAJOR eye roll there. I mean, duhhhh, all, and I mean ALL, the evidence is right in front of her and she's too stupid to make the connections??? Give. Me. A. Break. I thought she was supposed to be intelligent. The scene with Jacque-Philip at Tor Hill? Puh-lease. How naive can she be? Personally, I'd've leaped to the conclusion that the attacker was him way before anyone else! Tragedy, drama, whining, the stupid trope, it's all here. The ending was happy enough, and much too easy. It’s so romantic that Angelet and Benedict are free to marry each other, having been childhood sweethearts separated by events. They’re so incredibly happy with only one fly in the ointment: Rebecca hates her new stepfather for taking the place of the father she never knew. When Angelet becomes pregnant, Rebecca looks forward to her new brother or sister arriving. What no one anticipates is how hard the birth is. And Benedict is like Sir Ronald, unforgiving. It’s a pair they are, two people hating in a family with a newborn. Rebecca is Angelet's beloved daughter. Angelet Mandeville lost her husband during a rescue attempt in Australia. Now she lives in London with her daughter and visits her grandparents often at Cador, their house in Cornwall. Miss Brown is Rebecca's governess. Mr. and Mrs. Emery are the handyman and housekeeper/cook in the London house; they'll be elevated to butler and housekeeper when they move to Manorleigh The maids, Jane and Ann, will move as well. Mrs. Grant is the cook hired for Manorleigh. Alfred is a footman in the London house. The baby is Belinda Mary, and Leah will become her nurse. Jim Fedder is a groom in the Manorleigh stables. Miss Stringer is Belinda and Lucie's governess. Miss Martha is the daughter who survived her mother's, Lady Flamstead's death. Sir Ronald never forgave her. Rolf is Becca's grandfather; Annora is her grandmother. Jack is Angelet's brother; he and his wife, Marian, will inherit Cador when their parents die. They have two children, twins: Jacco and Anne-Mary. Mrs. Garnett is the cook at Cador. Jim Isaacs and Stubbs are two of the grooms. Dr. Wilmington is the family doctor. Madge is a new kitchen maid with a loose tongue. Pedrek Cartwright is Rebecca's best friend — they were born in the same house out in Australia. His grandparents, Josiah Pencarron and his wife, own a mine near Rebecca's grandparents' home in Cornwall. Justin and Morwenna Cartwright are Pedrek's parents who live in London. Benedict Lansdon is the grandson of "Uncle" Peter, a great friend of Rebecca's family. Amaryllis is Peter's wife. Peterkin is their son, and he works with his wife, Frances, at the Mission his father established. Helena is Peter and Amaryliss' daughter and is married to a politician, Martin Hume. I'm not sure where Grace Hume fits in, other than she's worked closely with Benedict at some point besides working at the Mission. The wealthy Lizzie Morley was Benedict's first wife. Celeste Bourdon will become his third. Yvette is her lady's maid. Oliver Gerson is a charming business colleague of Benedict's whom he inherited when Uncle Peter's businesses came to him. Tom Marner is an Australian mine owner and colleague who visits Benedict at Manorleigh. Jenny Stubbs is a young woman who lost a child she cared for and so lost a bit of her mind as well. She becomes pregnant with Lucie. She works for the kindly Mrs. Bullet and, I guess, Mrs. Granger. Mrs. Polhenny is an excellent midwife and vituperative religious nut job. Leah is her much-abused daughter who does beautiful embroidery. The Bourdons are French émigrés who will buy High Tor. Celeste is the daughter; the licentious Jean Pascal is the son. The Stennings are the latest tenants of High Tor. Madame Perrotte is teaching Rebecca to curtsy for her presentation. Jack Kellaway worked for Josiah and was injured in a mining accident. A tragedy left his wife, Mary, and daughter, Mary, alone. The cover is gothic enough with its woods and the tightly buttoned-up Rebecca sitting on the stone bench with her letter and the mysterious gentleman in the background. With all that orange on the ground, I’m tempted to say it’s autumn, but the trees still have their leaves. The title is where it ends up, with The Changeling. A rather obvious one. The Changeling is not a mystery, nor is it a good historical novel, both of which are genres I love. Instead it is a stereotypical romance novel that just happens to be set in Victorian England. The author dropped a couple of names (Disraeli and Gladstone)and describes the Queen (in passing) as "a diminutive figure with an expression of gloom and an air of aloofness which was rather disconcerting." But this was not enough to truly leave the reader with a sense of the time or place in which the story was set. Mystery? No mystery here. Read the title. Story? Read the jacket fly leaf and save yourself time. I just could not read this book. It was written well, the characters were fleshed out, the settings well described and plausible, but after 78 pages I just didn't care about the young lady's dislike of her stepfather and that was all that seemed to be discussed. As a rule I can't read this author's books fast enough so I honestly don't know what happened with this one. Part of a series of mother to daughter generations stories telling the history of England from Henry VIII to WW II. Fabulous to read them all in order. Each one is a gem; each is surprising and well written. This reflects a bit of the eerie feeling that Victoria Holt is famous for; Phillipa Carr is another pen name. This review has been hidden because it contains spoilers. To view it, click here. I love the daughters of England series but I just did not like this book. I think Philippa Carr missed the mark on this one. The historical info she usually writes about wasn't there, and I missed reading about family members from previous books growing old and the mature knowledge they provide. The death of her mother at the beginning of the book left me disappointed. Another excellent installment in the gothic romance world of Philippa Carr (aka Victoria Holt). Yet another well done twist (had my suspicions throughout the book, but was not sure till the end). Historically accurate and interesting read. I was all along expecting that Leah had a secret child with the Frenchman,and that this would be revealed at some point in the story, but not the swapping of the babies by the midwife! The writing was fine, but the storyline reminded me of a night-time drama or soap opera. I suppose it fits with when the book was written. Gotta love those 80s! Not as repetitious as some of the previous entries in this series. Plot was predictable. Good character development. It is not too difficult to guess who the "changeling" is, but knowing in advance does not spoil the satisfaction of seeing what direction things take. Set in Victorian London and Cornwall. Everybody lives happily ever after. Even the bad guys turn out not to be bad. A little sappy. Excellent book. The storyline has many twists and turns. I would highly recommend the author,Philippa Carr to all my friends. Eleanor Alice Burford, Mrs. George Percival Hibbert was a British author of about 200 historical novels, most of them under the pen name Jean Plaidy which had sold 14 million copies by the time of her death. She chose to use various names because of the differences in subject matter between her books; the best-known, apart from Plaidy, are Victoria Holt (56 million) and Philippa Carr (3 million). Eleanor Alice Burford, Mrs. George Percival Hibbert was a British author of about 200 historical novels, most of them under the pen name Jean Plaidy which had sold 14 million copies by the time of her death. She chose to use various names because of the differences in subject matter between her books; the best-known, apart from Plaidy, are Victoria Holt (56 million) and Philippa Carr (3 million). Lesser known were the novels Hibbert published under her maiden name Eleanor Burford, or the pseudonyms of Elbur Ford, Kathleen Kellow, Anna Percival and Ellalice Tate. Many of her readers under one penname never suspected her other identities.